HARLINGEN — The cash is tapped for the first part of an $8.5 million super park. 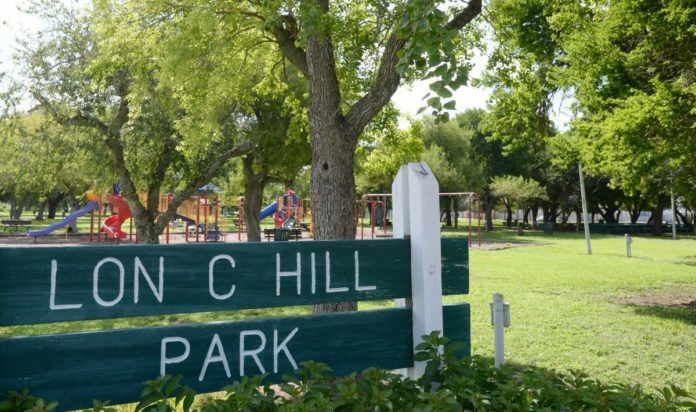 Yesterday, city commissioners met with members of the Harlingen Community Improvement Board to approve $2.6 million to build a so-called destination park at Lon C. Hill Park. Officials plan to earmark money from the Community Improvement Board sales tax to fund the first phase of the project aimed at drawing tourism to town. But they set no timeline in which to launch the project, selected as one of the city’s top priorities in the new 10-year comprehensive plan. “Realistically, we’re just setting that money aside,” Mayor Chris Boswell said. The first phase would set the foundation for the super park, whose five phases would include features such as an amphitheater, athletic courts, an adaptive field aimed at special needs children, a discovery center and a dog park. “What we want to create is an area the family can go — to have a family atmosphere with different components,” City Manager Dan Serna said. The project’s fifth phase is expected to build a $1.2 million retractable roof over Harlingen Field. Serna said the park would draw visitors from across the region. “Those folks are going to get hungry and thirsty, eat in our restaurants and shop in our shops,” he said. Since last year, officials have downscaled the project, originally carrying a price tag of $12.9 million. In May, Commissioner Michael Mezmar spoke out against borrowing money to build the super park. Two months later, commissioners scrapped plans to borrow money for the project. In the same July meeting, commissioners tacked on an additional $1.75 million to their project to build the convention center, now carrying a total price tag of $16.7 million. In that meeting, Commissioner Tudor Uhlhorn said he did not want to squeeze the Community Improvement Board’s budget, fueled by sales tax revenue earmarked to fund so-called quality of life projects. Now, the city plans to use cash and grants to build the park in five phases, stretching out the project for as long as eight years. Yesterday, officials approved the Community Improvement Board’s budget for the upcoming fiscal year. Next year, the agency’s sales tax is projected to generate $1.3 million. Now, the agency’s fund balance stands at $5.8 million, said Sergio Villasana, the city’s assistant finance director. Villasana said city projects are expected to reduce that fund balance to $3.8 million by the end of the next fiscal year. The city will tap into the fund balance to build the convention center. Serna said new businesses and development are projected to pump more sales tax revenue into the fund balance.